Identify and correct the cause of a wastewater discharge permit non-compliance. 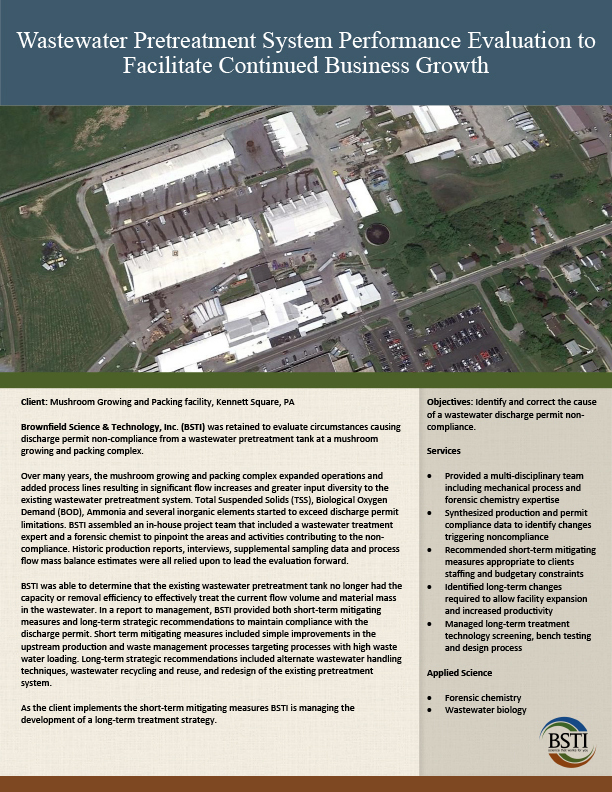 Brownfield Science & Technology, Inc. (BSTI) was retained to evaluate circumstances causing discharge permit non-compliance from a wastewater pretreatment tank at a mushroom growing and packing complex. Over many years, the mushroom growing and packing complex expanded operations and added process lines resulting in significant flow increases and greater input diversity to the existing wastewater pretreatment system. Total Suspended Solids (TSS), Biological Oxygen Demand (BOD), Ammonia and several inorganic elements started to exceed discharge permit limitations. BSTI assembled an in-house project team that included a wastewater treatment expert and a forensic chemist to pinpoint the areas and activities contributing to the non-compliance. Historic production reports, interviews, supplemental sampling data and process flow mass balance estimates were all relied upon to lead the evaluation forward. BSTI was able to determine that the existing wastewater pretreatment tank no longer had the capacity or removal efficiency to effectively treat the current flow volume and material mass in the wastewater. In a report to management, BSTI provided both short-term mitigating measures and long-term strategic recommendations to maintain compliance with the discharge permit. Short term mitigating measures included simple improvements in the upstream production and waste management processes targeting processes with high waste water loading. Long-term strategic recommendations included alternate wastewater handling techniques, wastewater recycling and reuse, and redesign of the existing pretreatment system. As the client implements the short-term mitigating measures BSTI is managing the development of a long-term treatment strategy.